I am totally excited! Now that we are finished with lockdown and summer is upon us, it's time to introduce the kids to some awesome activities! So to help us keep track of our summer adventures, we have created our first ever Summer Bucket List! Visit the City Market. It's a giant farmer's market/ethnic food/Amish bakery/everything hang out. Plus, their produce is super cheap! done! Go back to Church. done! Visit the Deanna Rose Farmstead. It's farm/petting zoo for kids. Go to the Kansas City Zoo. Is it even summer without the zoo? Plus, my parents gave us season passes for the kids' 2nd birthday! I love "experience" gifts! Now we can enjoy it all summer long for free! Little Monkey Bizness. It's our favorite indoor playland in the metro area! We had the kids' 1st birthday party there and are planning to have their 2nd birthday party there as well. Plus, they keep it so clean so I don't spaz about germs! done! Family Barbecue. We try to have our family over for a barbecue every summer. We keep it simple in the backyard, and just enjoy hanging out. Blow Bubbles and Pop Them! Some of these are things we did last year that the kids loved. Bubbles are always a winner! Go Swimming/Play in the Sprinklers All we have to do is pull our inflatable kiddie pool out of the garage and blow it up, or set out some sprinklers! Or both! done! Sand and Water Table. We were given this awesome table by friends who were moving out of state. You fill one side with sand and the other side with water and it's a wonderful sensory toy! Ice Cream Bars or Popsicles in the Backyard. A must during the summer! Draw with Chalk. Hopefully they don't try to eat it! Eat Out at a Sit-Down Restaurant. It could be kind of crazy... done! Go to a Store. It seems like a small thing, but we've never taken our kids to a store before. Too many germs! done! I think we are going to have a GREAT summer! And, of course, you will get to see what we are up to as we blog about each adventure we accomplish! And then, how fun is this? As I was brainstorming about our summer list, my friend Jen from 4tunate sent me an email. She has six-year-old quadruplets...all boys! She let me know that she is publishing her first eBook...50 KidVentures....and it is available starting today! I got a chance to read it, and absolutely love what she has created! Since I already had this post ready to go, I simply pushed it back a couple of days so that I could let you know about her book at the same time. 50 KidVentures contains 50 outdoor activities with step-by-step instructions, diagrams, printables, and tips to make it super easy for the adventures to become a reality. Thankfully, Jen realizes that money can be tight, so her adventures are very cost-effective and can often be done for free since a lot of the items needed can be found around the house. I also appreciate that every single one of these outdoor adventures is created in such a way that more than one child can participate at a time. Yay! It's sometimes surprisingly hard to find activities that work for our group! Here's a quick peek at some of my favorites! This original post didn't have the 50 KidVentures info in it, but I'm so happy that they coincided like this! It's really my pleasure to get to tell you about Jen's book. Sure, she's a friend, but this book is well thought out, well tested (six-year-old quadruplet boys is definitely a great test market! ), and one I can wholeheartedly endorse. If nothing else, because it makes it that much easier to have adventures and make family memories with our kids! Have you thought about summer yet? What are you planning on doing with your family? 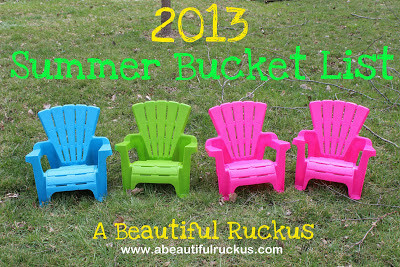 We linked this post up with Little Wonders' Days Summer Bucket List Party! Thanks for the tip on when to shop there! I didn't know where to find that info and we always like to save money! I admire you! I'm trying to talk my husband into letting me hire a high school girl this summer to go a few places with us. I will want to get out of the house! Some places you just need extra hands for safety with so many young ones! Maybe we should do something together? Not that that will improve the ratio of adults to kids, but it could be crazy and fun to experience stuff together! Oh my goodness, you are so my hero. I have twins and they keep me so busy. 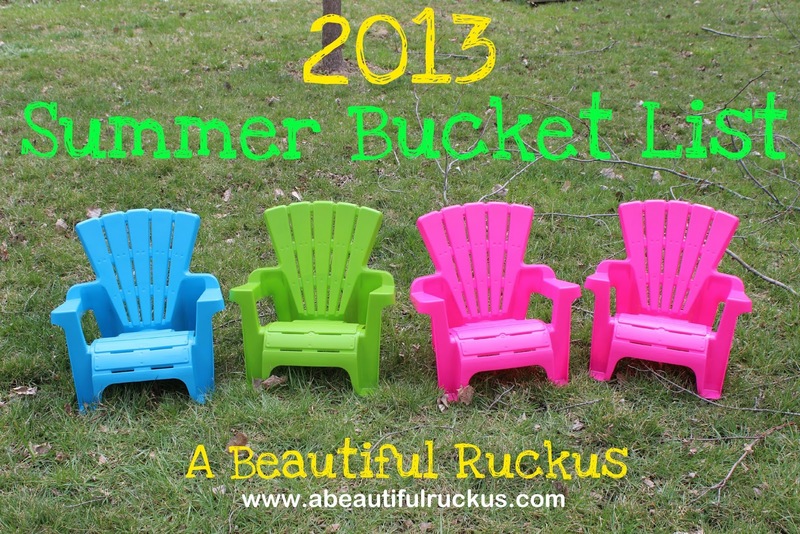 I think it's great that you are planning such a fun summer with your little ones. I'm so glad you linked up to the summer bucket list party. I can't wait to spend some time reading your blog. Thanks, Kelly! Your blog was recommended to me. I'm looking forward to following along with you as well! FUN! That sounds like an awesome way to spend a hot afternoon! Thanks for sharing your link! 50 KidVentures was one resource I used when compiling our Summer Bucket List. It's a great book!